Huawei RCS Client : What is RCS? Huawei RCS Client is a cross-platform application which provides you more powerful and convenient means of communication, and all of them are completely free on Wi-Fi. With RCS, you could place a very high-quality IP voice call or video call to anyone else on RCS. And additional features including sending text, voice messages or photos are also provided to extremely enhance your communication experience. 1, Voice call: Anytime, anywhere, and any device having a RCS installed, you could place free, and high-quality calls for RCS-to-RCS to your friend. 2, Video call: Would like to share the enchanting scenery? Or just miss the face of your love? 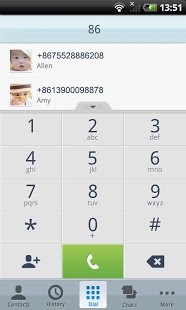 Open RCS and place a video call, you’ll find everything becomes so easy. 3, Instant message: Only text is not enough. Try to send a photo, a record of your voice or a map having your location to your friend to express more. Operator data charges may apply when on 3G cellular network. Huawei RCS Client requires Android 2.2 or above. Sending and receiving video require front or rear camera. Better to have both. very good experience very good exoerience in voice.quality!